While parenthood is certainly a joy, your home and your car are no longer your own. 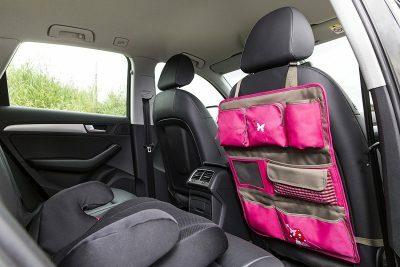 Luckily, products like the 4Kids Backseat Car Organizer exist to help you keep a little of your sanity while on the go. The 4Kids Backseat Car Organizer is a multi-pocketed device which allows you to store pretty much anything, from toys and games to books and snacks. It rolls up, making it easy to transport from vehicle to vehicle, and it comes with two handy straps that attach it to the car seat and double up as carrying handles. 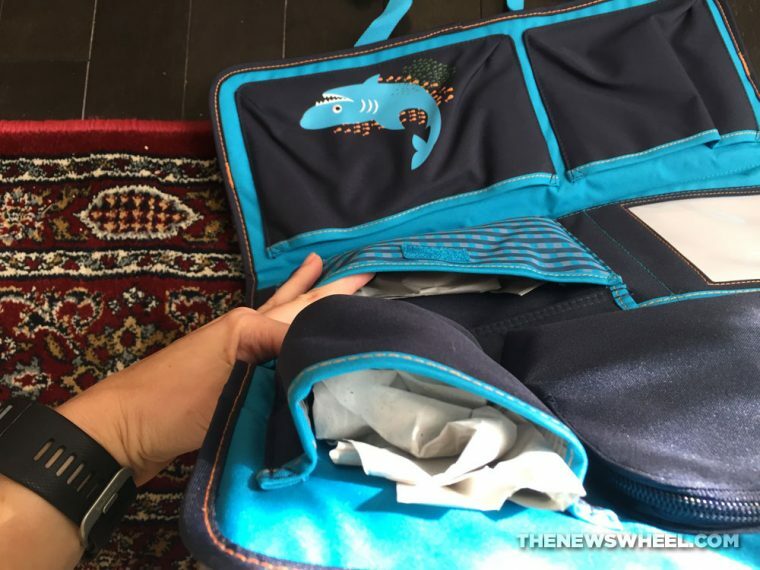 In total, the 4Kids Backseat Car Organizer comes with seven pockets of varying sizes—some with zips to secure them, some with Velcro, and some just open pockets. The organizer comes in four color choices—Mushroom Magenta (bright pink and brown), Shark Ocean (blue and black), Starlight Magenta (light pink, green, and beige), and Starlight Olive (khaki, light blue, and brown). 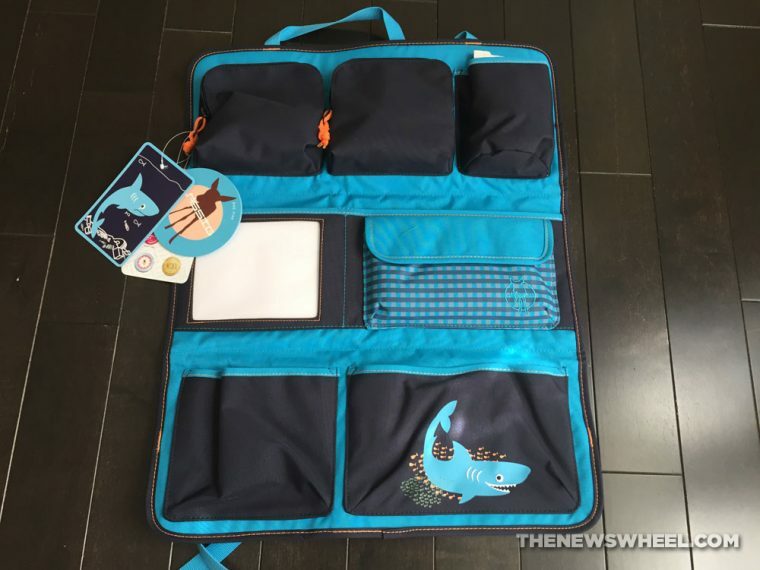 I was sent the Shark Ocean organizer from HabaUSA for review, which secretly would have been the one I would have picked—I prefer bold colors and typically try to stay away from pink for my little girl. The 4Kids Backseat Car Organizer is made from durable polyester in a variety of hues. It arrived wrapped in plastic inside a box, and each pocket was stuffed with paper to keep their shape. After using it for a couple of weeks, I would say that it seems like it will hold up for a good few years. 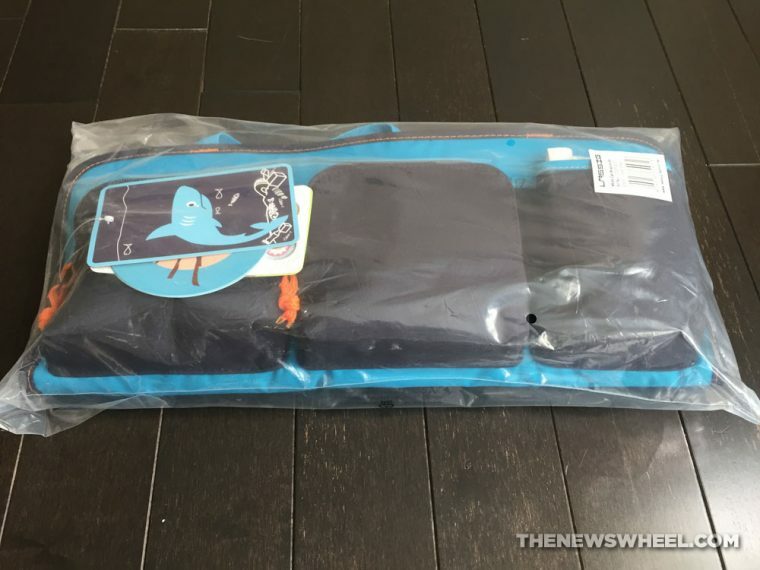 The only potential negative I could see is that the straps are quite thin (though they are securely sewn onto the organizer), and when faced with a toddler having a backseat tantrum could be ripped off the back of the seat. However, I imagine that you would have to have a pretty strong toddler for that to happen. The 4Kids Backseat Car Organizer is so simple to use that I was able to figure it out with no directions (which is good because none are provided). When you first receive the organizer, it will be rolled up and fastened. Simply unclip the fasteners and attach the top strap around the head rest of the front seat, and the bottom strap around the bottom of the front seat. When you’re done using the 4Kids Backseat Car Organizer, just remove it from the front seat and roll it back up, fastening it using the straps. The 4Kids Backseat Car Organizer is a nifty invention that transforms your car from a place where old toys and raisins go to die to an organized haven that allows you to drive your friends to lunch without the risk of them accidentally sitting on your kid’s sunglasses or favorite book. Bigger items, however, will roam free in your car due to the organizer’s size constraints. But this fact is true of all car organizers I have seen, so I don’t necessarily see this as a negative. Overall, the 4Kids Backseat Car Organizer is great for parents who want to keep their back seats a little more organized. However, while Haba’s website states that the organizer is perfect for kids as young as 1 up to age 6+, I’m not sure I will personally get much use out of it in the short term as my 19-month-old daughter is in a rear-facing car seat. Since I plan to keep her rear-facing as long as possible, I’m not sure when she will actually be able to use the organizer. In the meantime, however, it’s a useful place for me to keep essentials like spare wipes, books, and clothes that she might need on the road. The 4Kids Backseat Car Organizer is available through the manufacturer’s website and Amazon .